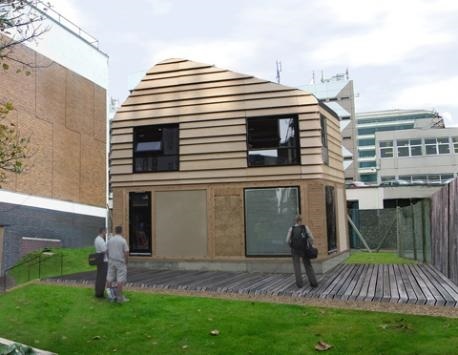 Waste House is being constructed in the Grand Parade Campus of University of Brighton. Brighton is town in the southeast of England, UK. Duncan Baker Brown and Cat Fletcher are leads in the project. It is a challenging project. This house is going to be used as a studio for postgraduate design students. It will be open to public for viewing. The aim of the project is to demonstrate how waste can be efficiently used for the construction purposes without having to compromise on the quality. Since it is second hand timber and that its strength cannot be determined, the structural engineer assumes that the timber is of the weakest type and compensates in the design accordingly. They are made up of salvage ply with lots of bits of timber in it. Ground floor slab and foundations have been cast by compacting earth and aggregate avoiding too much cement. Ian Mitchel & Sara MacLean of Vent-Axia Group supplied the second hand Mechanical Ventilation & Heat Recovery unit that will ensure that all-electric house runs on the minimum of mains power. They are date sensitive and used only once. They can be recycled if brass eyelets that are used to tie them to street lights during art festivals were removed. Cat Fletcher got 1000 of them and they have been used as internal vapour control layers. There will be wall finishes over the banners. They have also been used as damp proof courses around rational windows. Chandlers Sustainable Building solutions supplied Porotherm Clay blocks. They are installed on exposed vaulted ceiling on first floor. Dupont Building Innovations supplied Tyvek Vapour Control and Building membranes for external walls. They are used in low energy timber frame construction projects to control the flow of condensation through the fabric of the building. Ejot UK Ltd supplied long screw fixings to secure external wall and roof insulation. They also supplied the fixing system for the photovoltaic solar panels. The Velux Company Ltd supplied triple glazed Integra roof lights and come with external and internal automatic blinds. The company claims that the roof lights give 20% more natural light as compared to the conventional roof lights available in the market. Rational supplied doors and windows. South Downs Solar supplied solar panels. It has been rammed with the help of a compressor and pneumatic rammer. The Waste House project is quite interesting. Duncan Baker Brown is the architect behind the project. It will be interesting to see how energy efficient this structure turns out to be in future. The vision that people will start using waste to build homes is quite fascinating. Costs play a major role in construction. This is something that cannot be changed. People always prefer better quality at lower costs. The cost estimate for this project is £2200/sqm. This is expensive and not many people would happily spend so much money to build a house out of waste. This entry was posted by Benzu JK on April 15, 2014, 6:30 pm and is filed under Architecture, Sustainable Design. You can follow any responses to this entry through RSS 2.0.